Connecting STEM, PBL, and Tech Integration: What Would Dewey Think? It has been exciting to work in both the STEM, PBL, and technology integration field. In fact, I have an opportunity to provide professional development across the country involving all three. As a long-time advocate of STEM education, technology integration, and also Project Based Learning (PBL), I can’t help but see how these three concepts really do compliment one another. These initiatives take on three important roles to make a wonderful classroom learning environment for students. STEM (or STEAM) includes those all-important content standards and metacognitive skills that have often been taught isolated from each other. PBL provides an important process and pedagogy that allows for the integrated delivery of this content. Technology integration acts as the conductor, glue, and amplifier allowing for increased productivity and learning opportunities. Together, these three concepts provide the necessary conduit to the real world, breaking down the walls of the classroom and creating a real-world blended learning environment. Best practices behind the disciplines of STEM are changing. The Common Core State Standards, and other state high-quality standards (that have opted out of CCSS), place a strong emphasis on scientific literacy involving student thinking and writing about the process. These standards also demand that students understand concepts in depth while making relationships to real world applications. It is no longer acceptable to just find the answer to a math equation. Students must be able to apply their math skills to the real world. The Next Generation Science Standards promote the kind of application found in engineering and technology, demanding formulation of a problem that is solved by design thinking. These standards state, “Strengthening the engineering aspects of the Next Generation Science Standards will clarify for students the relevance of science, technology, engineering and mathematics (the four STEM fields) to everyday life.” I have often stated that STEM goes beyond the “nouns of its content” In this way, STEM becomes a way of thinking for all disciplines. In this transdisciplinary approach, we can now begin to see that Project Based Learning provides a necessary ingredient. PBL, with its emphasis on authenticity, connections, inquiry, and process, is able to provide these disciplines a necessary pedagogy. PBL is driven by inquiry that encompasses all disciplines. This inquiry becomes the center of students learning, and the content becomes blended. PBLallows students to own their learning while promoting the inquiry of science, resourcefulness of technology, design principles found in engineering, and application of math. PBL centering on driving question brings in language arts, social studies, fine and practical arts, foreign language, and humanities. Integrating the subjects encourages student innovation, promotes authentic learning, and allows students to see connections with their community and between content areas. It’s true; PBL can be the delivery method as well as the connector of separate content areas. While it is optimal to blend classes together, it is entirely possible to provide a STEM environment through teacher awareness of outside discipline areas and collaboration with other educators on school schedule. I began with technology integration at the start of my career integrating the use of scientific recording equipment, cameras, compasses, and archaeology tools to teach content area skills in the outdoor environment back in the 70’s. I tell this story because it is important to remember that tools are the foundation for technology integration. Today there are so many additional tools that can be used. It wasn’t until the advent of the Apple II that I started using a computer in the classroom, and at that point, I discovered another amazing tool. Today’s digital devices provide an opportunity for students to learn and inquire, as well as to produce, publish, and connect to the real world. It is the technology integration that provides the ability to amplify, empower , and drive the skills and metacognition of STEM and the process of PBL. Through this amplification our students become engaged and can enter a flow, allowing for authentic and exciting learning opportunities. While the computer is important, one must think beyond the device! Don’t forget those older tools (pre-computer) that may still be the right fit. Perhaps real paint offers something that digital paint cannot. On the other hand, embrace the opportunities that modern digital technologies makes possible for our students. 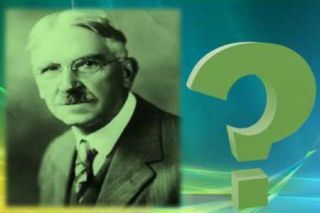 Imagine what John Dewey would do with all of the technological possibilities of today! This practice is at the very center of PBL, STEM, and technology integration. As we look at the Next Generation Science Standards, the 4C’s, ISTE Standards, the Common Core State Standards for math and literacy, and the other high-quality standards adopted by states outside of the CCSS, it is clear that PBL, STEM, and technology integration are a natural and essential connection. Together they provide a wonderful opportunity for real 21st-century learning!